The Daring Kind downloads on why podcast sponsorships are a win for your product or brand. You know what we love about podcasts? They introduce us to new brands via a trusted source. The magic sauce for a brand is the know, like and trust factor, and if you can add on the authority of a host, well, you’ve got yourself a winner. Trust leveraged. The best podcast sponsorships are a result of real stories (a.k.a. testimonials). This helps the listener imagine how the product or brand could benefits them. This is why The Daring Kind only endorses products and brands we love, and we write our own copy to help your brand connect with our listeners. The smartest podcast sponsorships include a call-to-action. In this way, you can drive trackable traffic to your website and convert. Done and done. Unlike a social media campaign or a print ad, a podcast sponsorship endures the lifetime of the show. This means your brand will only have more and more opportunity for exposure as time goes on. We call this everlasting love. Podcast sponsorships are available on a first come, first serve basis. 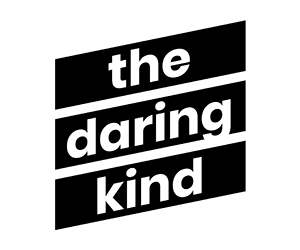 To learn about our opportunities, please email: hello@thedaringkind.com. Please include a short overview about your goals, a short notes on the product or service, and a link to the website. Please allow 48 hours for a reply, M-F. Let’s get to it!